Our Mission: To be a family of believers that Know Jesus, Love People, and Treasure Truth. As We Come to You in Prayer Now, Dear Lord, as we pray, take our hearts and minds far away. From the press of the world all around To Your throne where grace does abound. May our lives be transform'd by Your love, May our souls be refreshed from above. (PLEASE KNEEL) At this moment, let people everywhere Join us now as we come to You in prayer. 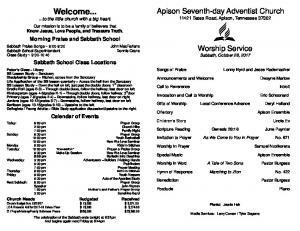 Today: 7:55 p.m. Next Friday: 8:00 p.m.
Apison Church Notices A SPECIAL WELCOME TO OUR VISITORS! We're happy you have chosen to worship with us today. If we can help you in any way, please see Head Elder Eric Schoonard or today’s Resource Elder, Bill Dean. 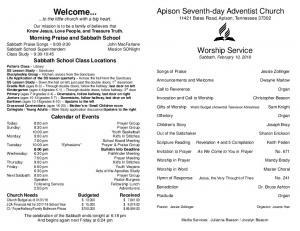 Membership Transfers ~ 2nd Reading Incoming: Clair Kitson, from Collegedale SDA Church, Collegedale, TN. Outgoing: Margaret Frost, to Detroit Oakwood SDA Church, Taylor, MI. Prayer Requests ~ Bereavement / Special Needs / Healing ~ Sue Bruce ~ continues to have trouble with MS, loss of vision in left eye. Dean Coulter ~ recovering from a biking accident. Steve Springer's granddaughter Maya ~ born preemie, growing, and overcoming hurdles. Prison Ministry ~ please find addresses on the bulletin board for fellow members in prison and encourage them by sending cards. Are you looking to be a committed man or woman who has a passion for souls to be trained and mentored to minister to the forgotten ones who are in our local jails? Call John for info 423316-6722. 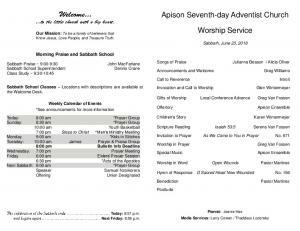 Apison Hour of Prayer (AHOPe) ~ Join us as we seek the Holy Spirit for our lives, our church, the world church and government leaders. 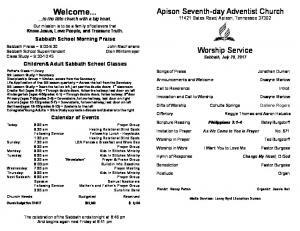 Sabbaths at 8 a.m., either in the Church Library or via conference call at 712-775-7031; access code 682-097-212#. Also Sundays at 8:30 a.m. at the same phone number and code. TONIGHT is Family Fun Night! ~ Vespers will start at 7:30 followed by popcorn and an inspirational family-friendly movie based on a true story. Bring your family and friends! Men's Ministry Steps to Christ Book Study ~ Join us Sundays at 7 p.m. at Greg Williams’ office, 11014 Apison Pike, as we seek a closer walk with Jesus. Kids in Stitches (Women Creating for Children) ~ Join us on Mondays and Thursdays 9 - 1 at the church. For questions, Penny White, 423-883-4476. Acts of the Apostles Study ~ The study is cancelled this Friday; however, please join us for the Agape Feast and Communion at 6 p.m. A Nedley Depression and Anxiety Recovery Program ~ Come to one of the FREE introductory DVD presentations tomorrow, March 25, at 10 a.m. or Thursday, March 29, at 6:30 p.m. in the Fellowship Room for this upcoming program. See bulletin insert for more information. To sign up, call 423-236-4214. LCA Constituency Meeting & Spring Concert ~ Come participate in the School Constituency Meeting and enjoy the LCA Choir's Spring Concert tomorrow, March 25, at 6 p.m. in the LCA Gymnasium. There will be an art auction for an 8th grade fundraiser as well. We look forward to seeing you there. Agape Feast and Communion ~ Invite your family and friends to join us on Friday, March 30, at 6 p.m. in the gym for this special Communion. Please plan to bring finger foods such as washed fruit (grapes, tangerines, apples), veggies (celery sticks, baby carrots, broccoli florets, cherry tomatoes, olives), finger sandwiches, pita bread, hummus or other dips. Any questions, please call Lizette at 423 667-2921. Volunteers for clean-up are needed! Thank you. International Vegetarian Food Fair ~ Everyone is invited Sunday, April 8, 1-4 p.m.! Please contact Lizette if you plan to help with food, 423-667-2921. See bulletin insert for more information. Women’s Ministry ~ We are looking for ladies interested in joining the team! Contact Penny White, 423-883-4476. 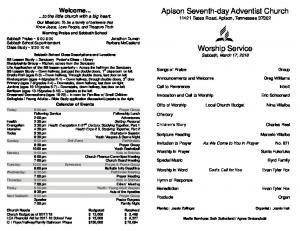 New Church Directory ~ For a hard copy, please place $10 in a tithe envelope, mark it “Directory,” include your name and phone number and place it in the offering plate. 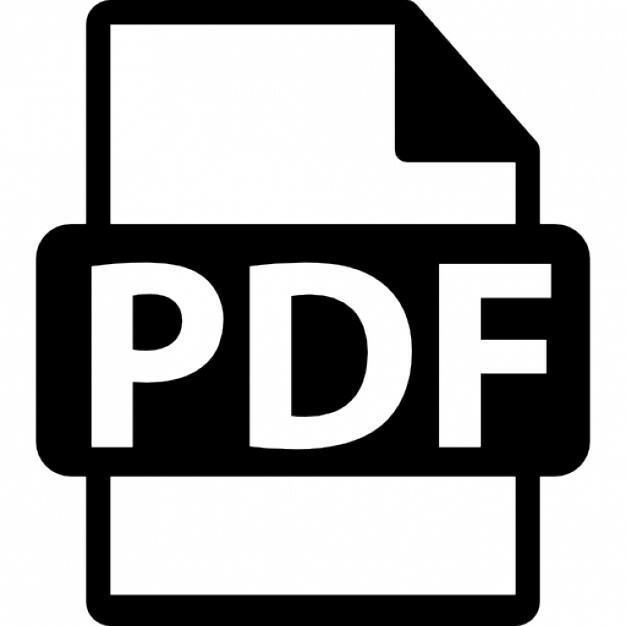 If you have not received an update for your hard copy, please let Noelle know (there is no additional charge for an update). For an electronic copy, please contact Noelle Holland at 423-785-6108. LCA Heating/Cooling System ~ Our school’s HVAC system needs to be replaced with a cost of $16,000. Fortunately full enrollment helps us cover expenses like this, but if you are able to give extra after tithing and supporting the church budget, donations are welcome. Area Announcements ~ See the bulletin board in the hall weekly. Special Notice: Memorial Service ~ Martin Knopper, father of Fred Knopper, passed away February 11. A memorial service will be held today, March 24, at 4 p.m. at the Collegedale SDA Church. Visitation will take place in the Atrium at 3 p.m. Memorial contributions can be made via online to It Is Written, Martin Knopper Memorial TV Fund. The website address is www.itiswritten.com/give, or you may mail your gift to It Is Written, PO Box 6, Chattanooga, TN 37406. 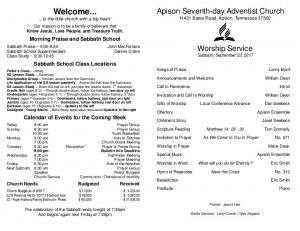 Area Announcements Evening Anthem Vespers ~ Today, March 24, at 7 p.m. Evening Anthem presents inSpirit Men's Chorus at the Chattanooga First SDA Church. You will be blessed by their excellence in musical presentation as we close the Sabbath together. 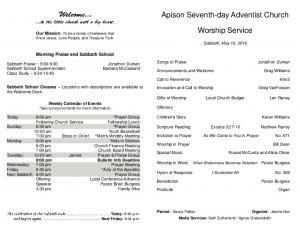 Collegedale Brass Choir ~ This evening, March 24, at 7:30 a short Evensong service in the Collegedale SDA Church will present “Praise to the Lord” and feature brass music of praise, both old and new. Directed by Ken Parsons and with organist Joshua Knight. Archaeology Lecture ~ Monday, March 26, at 7 p.m. Melinda Hartwig, PhD, curator of Egyptian, Nubian, and Ancient Near Eastern Art at Emory University, will give a talk titled “Ancient Egyptian Tomb Painting and Identity” in the Lynn Wood Hall Chapel at Southern Adventist University. For more information, visit southern.edu/archaeology. CA Parent Night ~ As a followup to Academy Day, Wednesday, March 28, at 6 p.m. Collegedale Academy will be hosting a parent night for families that are new to CA. During this time, parents will learn about spiritual, academic, and extracurricular opportunities at Collegedale Academy. All who attend the parent night event and apply to CA that evening will have their application fee credited for the 2018-19 school year. For general info about Collegedale Academy, to schedule a visit, or to apply for enrollment visit GCSS.org or call 423.396.2124. Atlanta Adventist Academy Open Enrollment ~ You have many choices when it comes to secondary education; however, our team is working hard to make AAA the premier choice for Adventist Christian Education. Enrollment is open for the 2018-2019 school year. Apply by March 31 and receive $65.00 discount on Registration in August. Go to www.aaa.edu, click on admissions, create an account and complete the application. Review the application, pay the $100.00 app fee and submit. The deadline for new students is June 30th; enroll soon to ensure a seat in the new school year. Questions about enrollment, e-mail Mrs. Mann at [email protected]; questions about finances, e-mail Mr. Williams at [email protected] or call the main office 404-699-1400.